2x 9lb and 10lbs 4oz Tench what a session. Having started off on a flier with a 7lbs 14oz male tench last visit I was beginning to hope that the big girls (tench) would start to move in. Arriving at the swim I wanted to fish found it free. Knowing the swim and area’s of gravel well I was soon sending out spombs of hemp, caster and small mixed pellets. I hadn’t arrived until 4pm in the afternoon having been pretty busy sorting plenty out for Mum. So once I was fishing it was time to sort out the bivvi and food. A really nice curry of Jalfrezi and rice was cooked up and consumed with a cup of tea. Time went by and apart from a few line bites nothing much happened. However at 7pm the right hand rod indicator burst into life and I was soon playing a small male of 5lbs 4oz. Pretty pleased that I wasn’t going to blank. The food when eaten outdoors I think together with the tea or coffee always tastes better in the open. I had a couple more bites just before dark that turned out to be one male 4lbs 8oz and a female of 4lbs 14oz. Now this was great news about the females moving in. As the daylight drifted away into darkness it was a great sunset. I always reel in during the night not wishing to catch the big brown monsters that swim in the lake. The occasional tench can be caught at night but it’s rare. 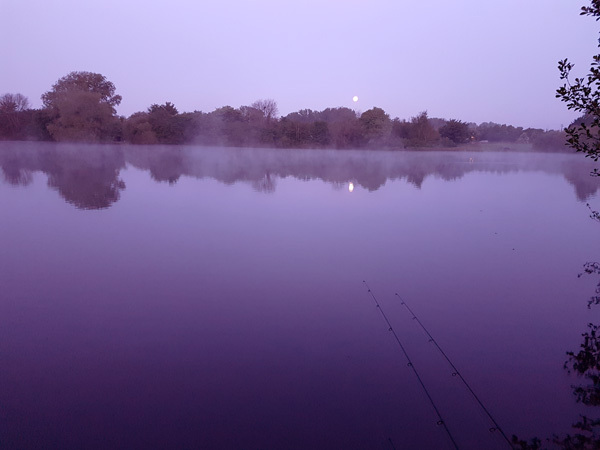 I prefer to be up early in the morning ready for the tench to feed at dawn. 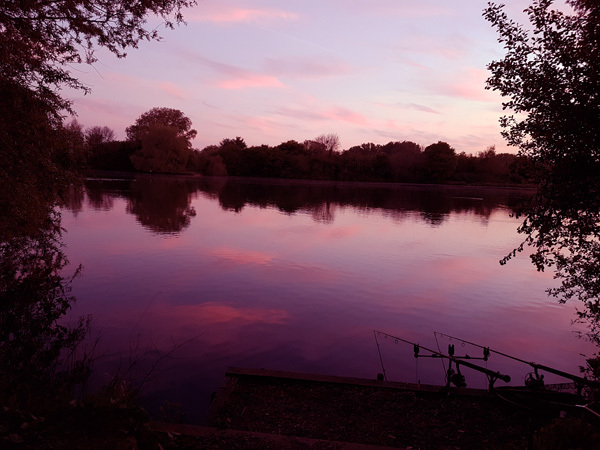 I had a great nights sleep and was up at 4.45am and put out some bait about 6 spombs to start of the previous mixture of hemp casters and pellets. Then out went the rods to the mark. 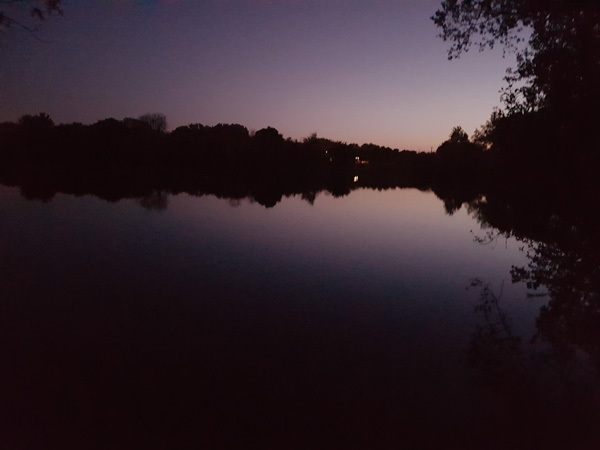 All the carp fishermen were fast asleep. The cacophony of sound from the bird song was a perfect way to awake. 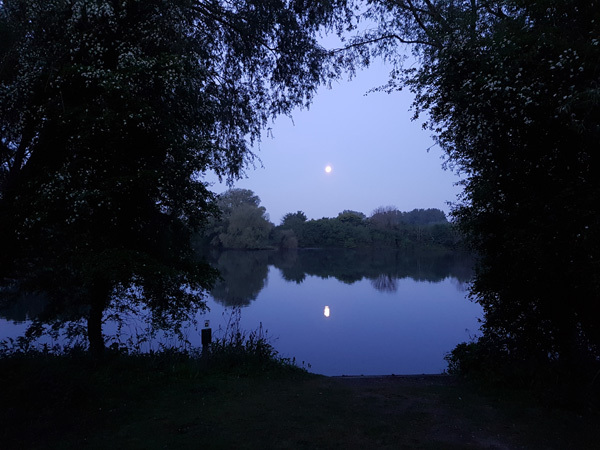 It wasn’t long before the first tench came along at 5.15am I hadn’t even had time to get my first fix of coffee and porridge. Then between that fish and 10am I had 7 lovely tench 6.3, 7.9, 8.6, 6.8, 4.9 and 8lbs 10oz. What a start to the day. 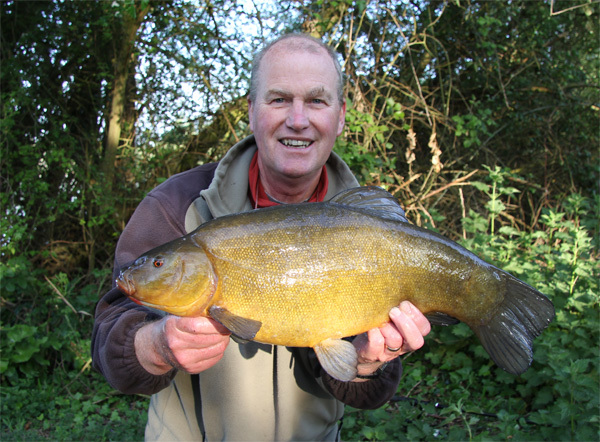 Every time I caught the 3rd tench more 3 spombs of feed were put out into the swim. The tench fed sporadically through the day and I ended with 10 and the last one coming at 9pm. Wow what a day and little did I know the following day would be better. Again the moon set almost the same time as the sun lightened the sky, few people have the privilege of seeing these sights. Us anglers appreciate all that’s around us. Getting up feeling refreshed at 4.45am after my sleep the normal spombing took place. This time I had time for coffee and porridge which went down very well. The first fish came at 6.00am at 6lbs 10oz female. 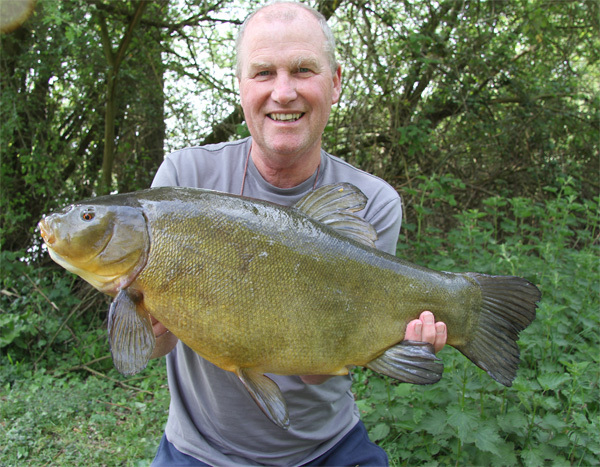 A great take followed by 9lbs 3oz tench. A beauty for sure it fought like hell then. Then I had another tench of 7lbs 10oz. It was busy around the camp and then I lost a very good tench that took me into weed. DISASTER. At 7am another fat female came to the net at 7lbs 9oz. So that was 5 tench in 1 hour of fishing. Then a 6lb 3oz female and 5lb male graced the net by 8am. The sport was relentless between 8am and 8.40am I lost another tench at the net then females of 5.5, 5.6 and 6lbs 13oz. I was stuck on 9 again, however had most of the day to get another one which would give me 10. Then at about 9 15am I had a great take from a tench that raced through the weed and kept going. I seriously thought it was a carp such was the speed it took. I had been filming on my gopro the ambience of the morning and the bird song for here. I stood watching the lakes surface for indications of tench in the swim. I then went and made a coffee and went back down the steps to stand by the rods looking nonchalant. I had hardly got there when the alarm went off. The rest is in the video. I was very very lucky to record this. What a piece of filming. Next came 6lb 4oz female tench at 10.15am. That’s 11 tench so far. Then the following happened 11am 5lbs 15oz female then a 5lbs 5oz male at 1pm. So 13 tench was it to be unlucky for some!!! Not for me a little later along came a 4lbs 12oz female. 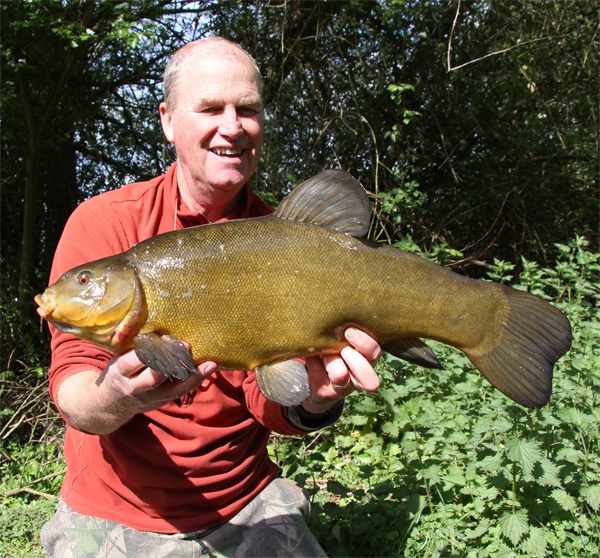 So what happened at 2.15pm the bite alarm burst into song as the tench decided to put as much distance from me as possible. Again I thought I had hooked a carp. The fight was incredible it went left and then right pulling all the time. It wasn’t until the fish was in the net that I realised what I fish I had caught. Elation was very much an understatement of how I felt. I could have jumped to the moon. By this time it was fish number 15 and what a day I had. The bait supply of casters was dwindling and only a couple of PVA bags were left. The last fish of the day was a beautiful tench of 8lbs 3oz. So by 4pm I was packing away. What a session, the tench are back on the lake big style. This entry was posted on Saturday, May 20th, 2017 at 8:30 pm	and is filed under Uncategorized. You can follow any responses to this entry through the RSS 2.0 feed. Both comments and pings are currently closed.